Who doesn’t like free? And who doesn’t like great iPad apps? When the two come together it’s good stuff. With that in mind, we’d like to share our Best Free iPad App of the Week here every weekend. 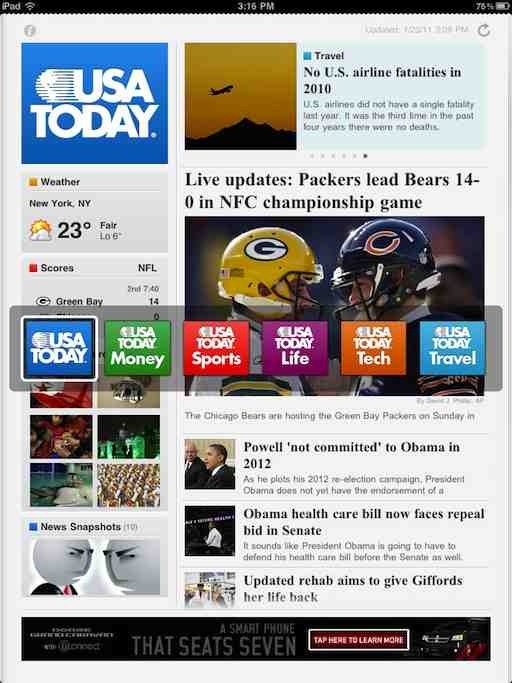 This week’s pick is USA Today for iPad. This is one of the very first newspapers with an iPad edition, that has been in the iPad App Store since the day it opened back in April 2010. It may not be the weightiest of newspapers and it’s not going to replace The Washington Post (or papers of that ilk) for those who want heavy, in-depth coverage – but it is a great iPad edition with a lot of excellent features. This is an excellent iPad edition of a popular newspaper. It’s the most iPad-friendly, interactive newspaper title I’ve seen so far. And the same still holds true today. 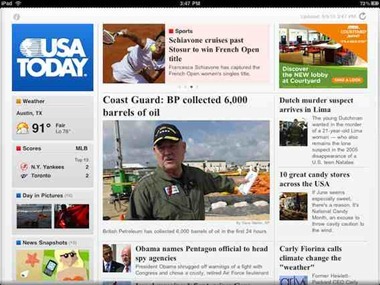 USA Today for iPad was updated yesterday, to Version 2.0.5. The big new feature in the update is the addition of breaking news within the app, and push notifications for breaking news. It also includes a minor UI update and some bug fixes. 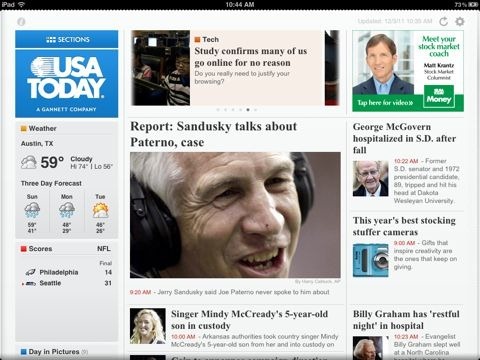 USA Today is already one of the best iPad newspaper editions – and breaking news is a very nice new feature for it. It’s one of the only things that was previously missing from the app, even though it has always been frequently updated throughout the day. 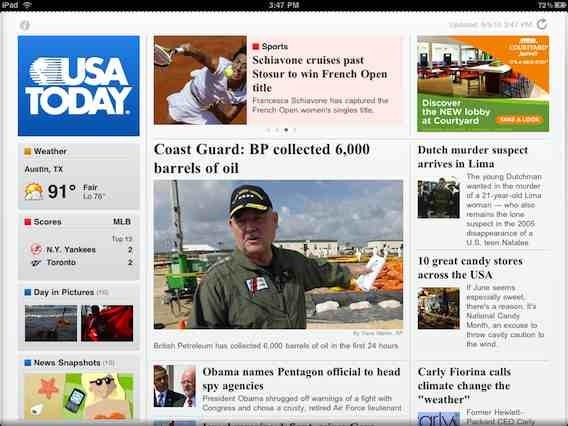 Here’s an App Store link for USA Today for iPad; it’s a free app. As the USA Today staff have had to cut costs and jobs to stay competitive, the success of the newspaper’s iPad app has been a "real positive" for the company, executives said Monday. That’s an excerpt from an article at Apple Insider last night. Apparently as part of a radical restructuring during the latter part of 2010, USA Today decided to focus on more of its resources on the iPad – and it looks as if that focus is paying off. "The iPad has been a real positive for USA Today," the Telegraph UK reported Gracia Martore, Chief Operating Officer at USA Today parent company Gannett as saying,. "We expect this will translate into a much more significant improvement" in revenue, she added. – USA TODAY’s tech coverage. – App Insider: frequent iPad app reviews. – TechWatch: a video player which features Talking Tech reviews with Ed Baig and Jefferson Graham and other gadget, gaming and industry news. – Week in Space photo galleries. 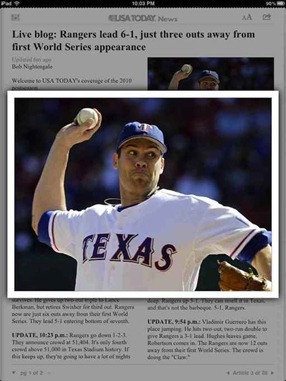 – Tapping an article image now enlarges the image. – Videos are now presented with related articles when available. Video is presented in an overlay, but can be expanded fullscreen with a pinch or by tapping the expand arrow in the video player controls. Both of these may be relatively minor features, but they’re also very iPad-like. They feel right and at home in an iPad edition. In fact, the more time I spend with USA Today for iPad, the more convinced I am that it’s far and away the best iPad edition of any major newspaper. 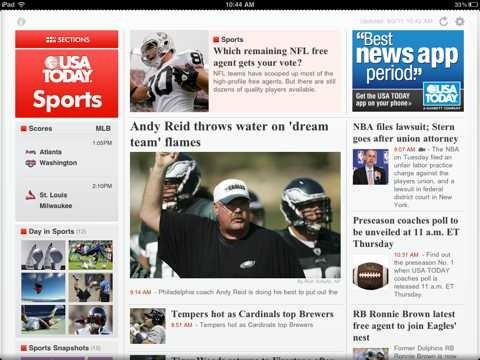 USA Today for iPad was one of the very first major newspaper apps to come out for the iPad, hitting the App Store in time for the the April 3rd release date. It took me a while to get around to checking USA Today for iPad out, as it has never been a favorite of mine among print titles. I’ve been running the app for several weeks now though, and I’ve been happily surprised to see it become one of my favorite everyday news sources thanks to this stellar iPad version.